Around the world British people are known for being ever-so-slightly dotty and eccentric. Of course, as a fully paid-up Brit myself, I can’t see anything remotely odd about our obsession with the weather, or with drinking endless cups of tea. 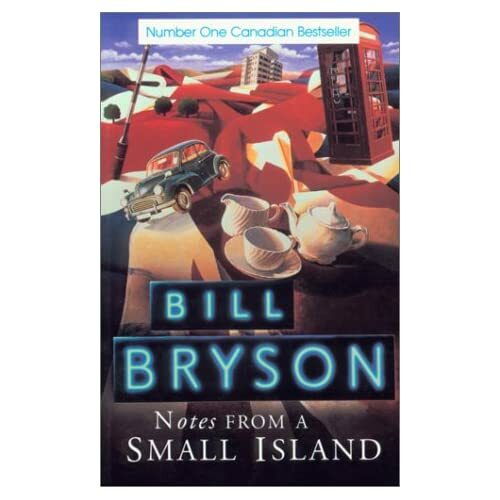 *g* But if you want to get a flavour of British life, and the peculiarities it displays to those on the outside, you could do worse than dip into ‘Notes From a Small Island’ by Bill Bryson. Bryson, a writer and humourist, was born in the US but moved to Britain to work – and promptly fell in love with the place. That love shines through his writing, giving it a warmth that other travel writers sometimes lack. Even when he’s poking gentle fun at the British way of life, he’s laughing with us as much as he is at us. He’s also incredibly observant, and a master at spotting the minutiae of daily life, and all those tiny differences between Britain and the rest of the world that make such a big difference overall. The book takes the form of a journey – Bryson’s last before heading back to the States with his family – starting at the famous White Cliffs of Dover and heading steadily north for 800 miles to the remote north coast of Scotland, before returning via the west coast. But it’s much less about geography and much more about the people Bryson meets en route, and their foibles and customs. The end result is both charming and very, very funny. I started laughing on the very first page, and didn’t stop again until I’d finished the book, some 350 pages later, with aching sides. For anyone who’s interested in a wry look at modern British life, this book is a must.